Caroline's big right now into "favorites." What's your favorite color? What's your favorite animal? What's your favorite ice cream? And no two people can have the same favorite anything. As we discussed our favorite flavors of ice cream last week, she informed me that her favorite flavor is "bamilla," and mine is strawberry. I honestly don't think I could choose a favorite, but strawberry is definitely up there, so I'll take it. In honor of my "favorite" flavor, I thought I would make a fun dessert for us to enjoy this week. However, I've been trying to keep things a bit lighter around here lately, and I've been wanting to try homemade frozen yogurt anyway, so I figured I'd give this recipe a try. 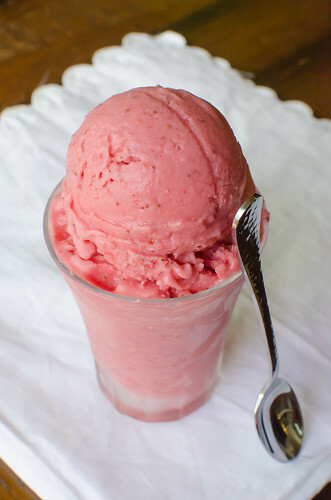 This frozen yogurt is embarrassingly easy. Strawberries are diced and then tossed with sugar, and then they sit for a bit to bring out all those wonderful juices. They are then pureed with the yogurt, chilled, and then the whole thing is frozen in your ice cream maker. It really doesn't get any easier. The instructions warn against using reduced fat yogurt, but I used 2% Greek yogurt, and I didn't notice it being too icy or hard. And I think it had a more intense yogurty flavor since Greek yogurt is a stronger flavor than plain (in my opinion anyway). There are a few things that I really love about this frozen yogurt: While I wouldn't classify it as "health food," it is much much lower in fat, sugar, and calories than ice cream. It is nice and sweet from the strawberries, but the sweetness is counteracted nicely by the tang from the yogurt. And finally, look how pretty it is! If you are like me and are obsessed with all things strawberry, then check out the Featured Recipes Page. I've updated it with some great recipes that use my favorite spring fruit! Toss the strawberries with the sugar and vodka in a large bowl. Stir until the sugar dissolves and the strawberries start to release their juices. Allow to sit at room temperature for about an hour, stirring every 10 minutes or so. Puree the strawberries and their liquids in a blender with the yogurt, salt, and lemon juice until smooth. If you don't like the seeds, then strain the mixture through a fine-mesh sieve into a large bowl. Otherwise, cover and refrigerate for at least 1 hour, or up to overnight. Freeze according to the instructions for your ice cream maker, and serve. Looks good. I might have to try making some frozen yogurt. I've made this and can taste it as I'm reading your post, so good! And as you said so pretty! This sounds absolutely lovely! Awesome idea! I can NOT wait to make this!! Yum! We have TONS of family coming into town over the next 6 weeks. I think this will make an appearance for each group of company! Looks amazing. Love the recipe! Perfect for a Spring/Summer dessert! YOU may not classify this as health food...but I do! Looks delicious to me! So sad that I don't have my ice cream maker her in China!! I'm going home to visit the states in a few weeks and I know what I'll be making when I stay at mom's! Come check out my new blog please! Thanks for the recipe. I made this Wednesday and already have another lb of strawberries on the grocery list to make again. It is easy and delicious! Frozen yogurt is so yummy. Andrew is into favorites right now too, and insists on a daily basis that my favorite color is purple. Not true, but I humor him. Haha!